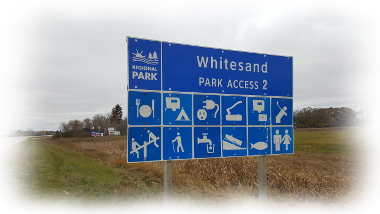 WHITESAND REGIONAL PARK is now closed for the season! New - Disc Golf! An 18 target disc golf course was added to the existing golf course! Regular golfers have the right of way since they tend to hit farther. There are marked trees and red targets throughout the course. Three discs are used for play, a driver disc, midrange disc and a putter disc. They are available at the park office for use (with a deposit of $60) Once the discs are returned you are refunded the $60. Check it out! New - Mini Golf is back! The mini golf course has been refurbished and ready for game time! Drop in and play a round when you get the chance!